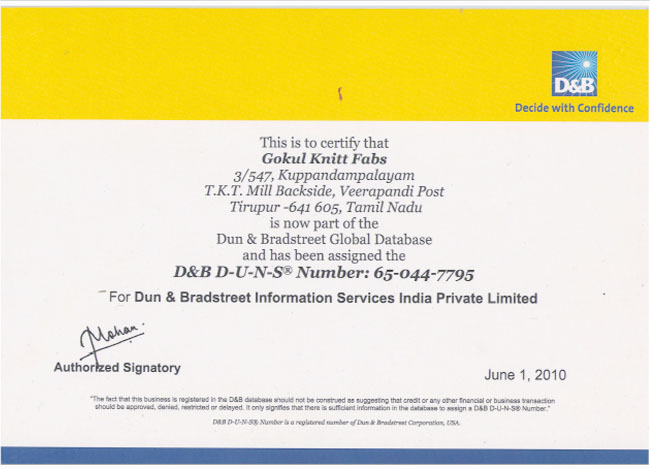 We at Gokul Knitt Fabs started our journey as Manufacturer Exporter in early 2005. Since inception we have been crafting the finest knitted garments with the continuous addition of world class sewing facilities at par with the international standards. Our core strength being Product Development & Design inputs backed by our in-house dynamic design development team. Our factory is now vertically integrated and manufacturing most of the fabrics. Our success in fabrication being the right selection of fibers from our dedicated suppliers from spinning mills to cater for our specific requirements. 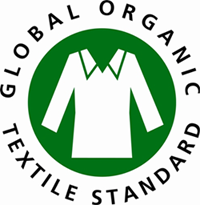 Our stringent and sincere quality control procedures starting from 100% fabric inspection by using 4 Point system to do on-line inspection in garmenting, end-line inspection which is supported by our independent TQA team ensures the best of its quality of the product we manufacture. 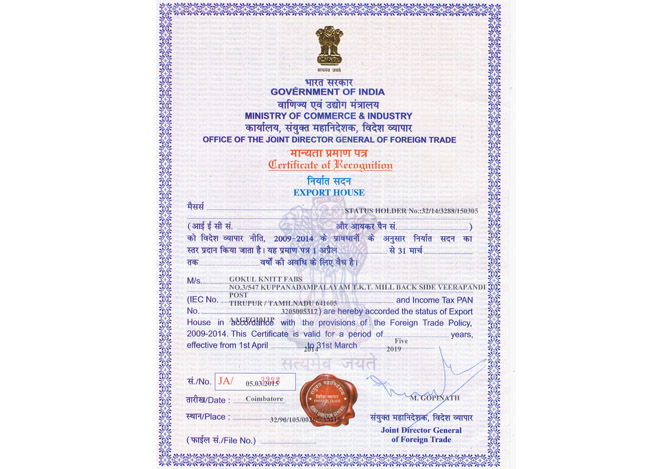 We at Gokul Knitt Fabs have implemented the latest ERP System which controls all the supply chain check points starting from yarn till the shipment and facilitates to monitor & adhere the TNA to meet the delivery schedule. 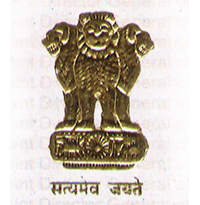 We manufacture 100 thousand knit garments every month and we are in the process of expanding to an additional of 200 thousand garments by July 2015 onwards. We are equipped to handle big & small orders as per the market requirements and our maximum market share falls within European clients. We manufacture all kinds of Men/Women/Boys/Girls and Kids/Infants knit-wear catering to all seasons like Spring/Summer/Autumn/Winter. and going towards BSCI ,WRAP for catering into USA market. We cordially welcome you to know about our customized services in detail. Thanks. Our most valuable asset is our Human Resource. It is imperative to develop people to take on the challenges of future. We have in house training facility for single needle, over lock, flat lock tailors and we believe in Multi Skilled training, Seminars and Workshops on relevant topics to groom the Associates on required competencies. This can be achieved only by continuously honing competencies and developing individuals to take on higher roles and greater responsibilities. Lead Time - Normally we work on 90 - 120 days lead time& for repeat orders we even work on 75 - 90 days lead time. We at GOKUL, always concentrates and spends manpower/money in sampling, we have dedicated sampling units to ensure quick turnaround around. We have a huge library for all kind of fabrics which can support the latest trends in the market and the buyers can select the fabric and make the samples with a quick turnaround time. Added to that we got a huge library of trims/accessories to support the sampling. Knitting plays a key role in the manufacturing process. State of the art knitting machines like Mayer & Cie, Oritzio, Terrot and Camber produce a variety of flawless knits including Single Jersey, Double Jersey, auto striped fabrics and Electronic Jacquards from high-quality yarn sourced from some of the best suppliers in the country. Single Jersey, Pique, Sheer Jersey, Interlock, Waffle, Ottoman, Flat Back Rib, Yarn Dyed Striper, Mini-Jacquard, Electronic Jacquard, Velour, Pointele and Suede Jersey, Fleece etc. We are capable of doing Solid Dyed, Yarn Dyed, Cold Pigment Dyed, Garment Dyed over print, Tie & Dye, Dip Dye and Indigo Dyed. Fabric dyeing - We have a cluster facility for dyeing the fabrics in 100% cotton and blends or 100% polyester and Lycra blends are processed to international quality standards. Future Plan - Knit Processing - We are planning to set-up the most modern processing unit in TIRUPUR where we can process 10 Tons fabrics per day, 6 Tons of Yarn dyeing and garment dyeing of 3 Tons per day with a latest color kitchen with reverse osmosis plant with our cluster facility. We at GOKUL have 12 color automatic glass table printing with all robotic dryers and ANSAL gas curing facility along with in-house design development team. Within short notice you can see our designs in your hand. Prints like Reactive, Puff, High Density, Phthalate Free PVC, Non PVC, Discharge on remazol grounds & pigments apart from some special printing techniques like burn out effects on polyester-cotton blends and Sublimation print qualities are achieved here. The unit has the capacity of 25000 pieces per day. And we have a cluster facility of 12 Color Rotary Printing Machines, with after-treatment machines like Continuous Ager, Loop Ager, Star Agers; Polymerizes & Washing Ranges find pride of place. The designing department is computerized with small yardages tackled on a Baby-Pilot Rotary Machine. We have an embroidery facility for all over fabrics and finished garments. Our in house facility with 2 BARUDAN machines each of 20 heads with 9 colors and 12 colors producing 1.5million stitches per day. Also our cluster embroidery facility can support sequencing, chenille and special operations in the machine. With the above capacity, the time of an order can be shorter. We got the expertise & experience to handle the most complicated sequencing & beadwork, we can handle over 40,000 pieces permonth. An innovative team under mature infrastructure is the pride of Gokul in Tirupur fashion industry. We got 2 state-of-the-art manufacturing facilities closer to each other in Tirupur with whooping 410 machines installed. It is supported by the latest automatic spreaders & CAD/CAM cutting from EASTMAN U.S.A and the best of the micro-process controlled sewing machines with under-bed trimmers. The state-of-the-art sewing facilities with online checking at critical points coupled with stringent quality controls at finishing section meeting the standards of our buyers. The facilities are with a total build up area over 60,000 sq. ft. in TIRUPUR to support manufacturing. We at Gokul Knitt Fabs, always give extra care and support on all new developments as we have a dedicated sampling unit to ensure quick delivery of samples to all our customers. The sampling units are equipped with the latest technology machines and well-experienced multi skilled tailors to handle all kinds of samples with a short lead-time. Our sample team consist of quality oriented head and supportive team of people with adequate technical support. We have a huge library for all kind of fabrics which can support the latest trends in the market and the buyers can select the fabric and make the samples with a quick turnaround time. Added to that we also got a huge library of trims / accessories to support the sampling. We have State of the art cutting room equipped with latest CAD/CAMS to provide precision cutting consistently from EASTMAN-USA, with automatic spreader and Band knife, Straight knife and other supportive equipments. Fabric is relaxed to control shrinkage. Our In house lab is testing various fabric parameters like shrinkage, spirality, wet and dry rub, color fastness to washing etc. before the cutting process. Mandatory fabric inspection is done, by our quality team to ensure defect free fabrics for the enhancement of garment quality. Lot wise GSM / Shade continuity cards maintained in cutting section. We work for ‘Quality First’ in each and every process. We educate our people to ensure quality in all floor levels, right from the procurement of yarn, knitting, dyeing, and garmenting, ironing and packing. A top-notch team of professionals consistently examine the intricacies of quality management through online. Right from the procurement of raw materials to the manufacturing of end product, they use latest quality technology system and methods to meet the needs of the buyer. 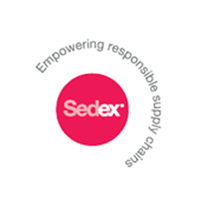 The company has been awarded certificates like GOTS, SEDEX and SA 8000 for quality management, environmental management and social accountability management. 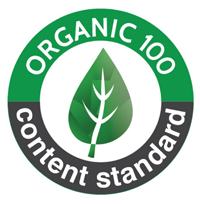 We have our own lab facility accredited by various brands to monitor quality at different levels. An In-house Testing Lab is functioning with experienced technicians to test the garments. With individual testing labs for Yarn, Fabric, Garment, Snap Pulling Machine, the independently acting Labs are fully equipped to perform for the International standards. We do all required testing for all the lots GSM, color fastness to washing and Rubbing, dimensional stability, appearance test after 3rd wash.
Apart from our regular testing, based on the clients requirements we do testing with SGS, ITS also for the promotional orders. We are equipped with Laundrometer, IFB washing machine with dryer, snap pull tester; wrap reel, yarn appearance winder, Gsm tester, crock meter, Gray scale for assessment. 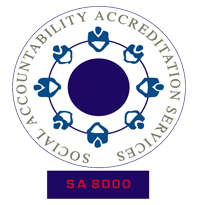 As a corporate citizen and a business entity that is evolving through continual improvement in ethical business, employee welfare and adherence to local and international laws has been certified as per SA – 8000 Standards. Social Accountability In charge: A responsible person is appointed as social accountability in charge to ensure that the requirement of the Clauses of SA-8000 is met at all times. Grievance Handling In charge: A qualified person is dedicated to addressing the grievance of the associates and is available during the working hours through the month. Health & Safety In-Charge: A qualified and experienced person is appointed as Health & Safety In charge to ensure that healthy and safe work environment is maintained in the factory premise. 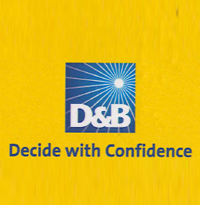 The top management, including the CEO of the company actively involves in ensuring that all the clauses of the SA – 8000 is followed strictly and sustained. Gokul Knitt Fabs has excellent infrastructure and highly skilled workforce to deliver highest quality products to international buyers. Thanks to Visit Our Website.